Goth Alternative Buenos Aires, Argentina! Recoleta Cemetery, Palermo street art, Eva Peron restaurant, La Cabrera. Don’t cry for me, Argentina… The truth is, I had a spectacular time in Buenos Aires! 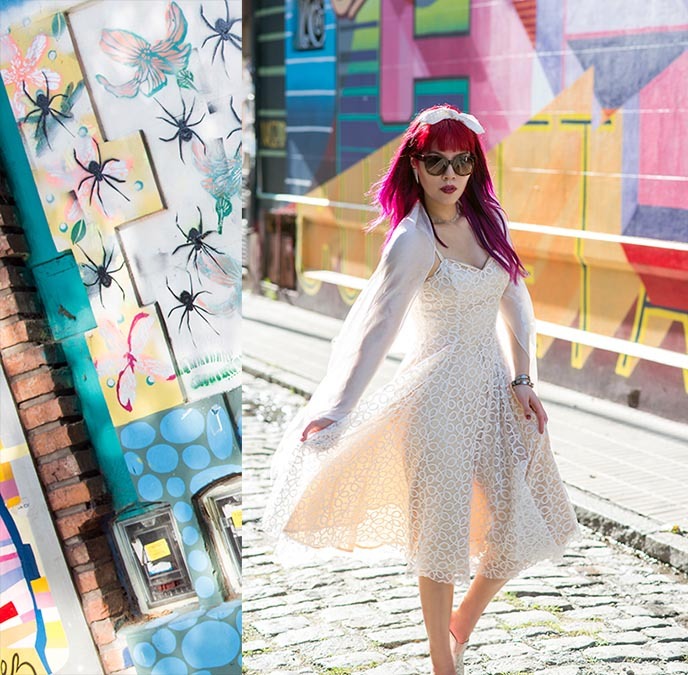 While exploring the South American city, I channeled Eva Peron’s style in a mid-century-style white dress. However, BA also has a hipster side, as you can see from the street art of the Palermo district. 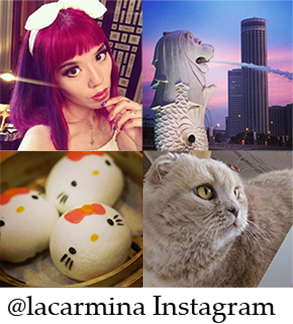 Wouldn’t you like to see the coolest parts of Buenos Aires with me? 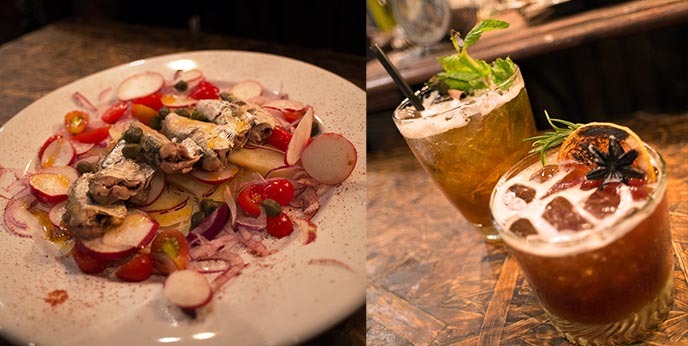 Follow along as we dine at the Eva and Juan Peron themed restaurant, scout colorful murals, and indulge in steak and gelato. Buenos Aires is a beautiful city, with a European feeling: picture wide, tree-lined avenues and stately architecture. 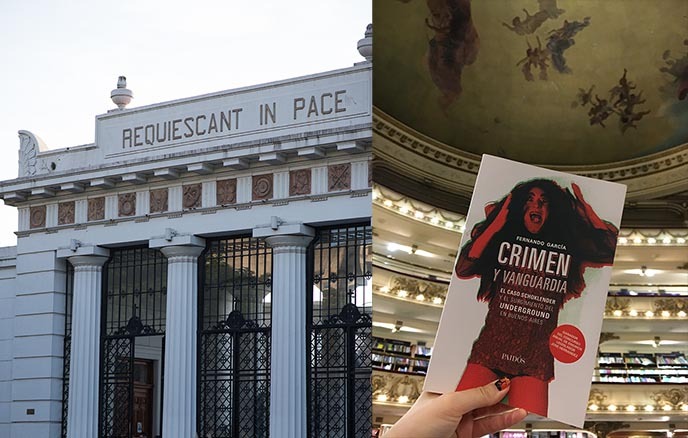 You can tell I was delighted to come to Argentina for the first time thanks to LATAM Airlines, which has many international flights to EZE (Ezeiza International Airport). I’m wearing my new Alexander McQueen / McQ sunglasses from Sunglasses Shop. Love the tortoiseshell pattern on these chunky frames, which have a vintage feel that matches my outfit. 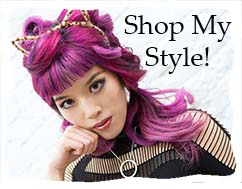 If you’re looking for fabulous summer shades, Sunglasses Shop has tons of authentic, luxury glasses available at low prices on their site. 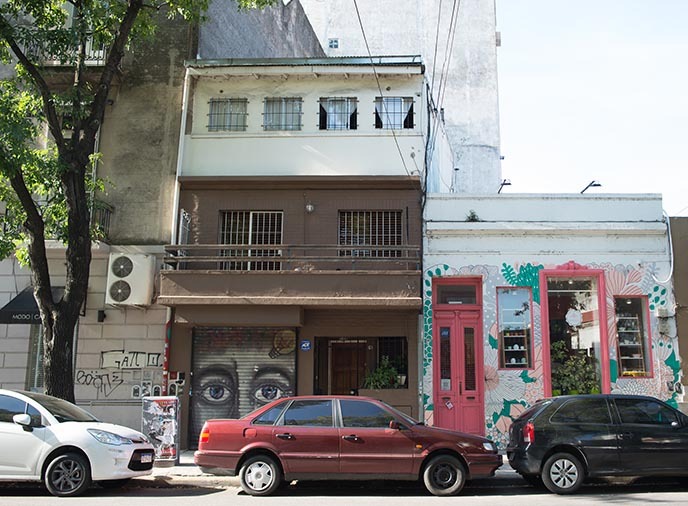 Buenos Aires is divided into various “barrios” or neighborhoods. One of the hippest barrios is Palermo, which consists of several sections: Hollywood, Soho and Viejo. 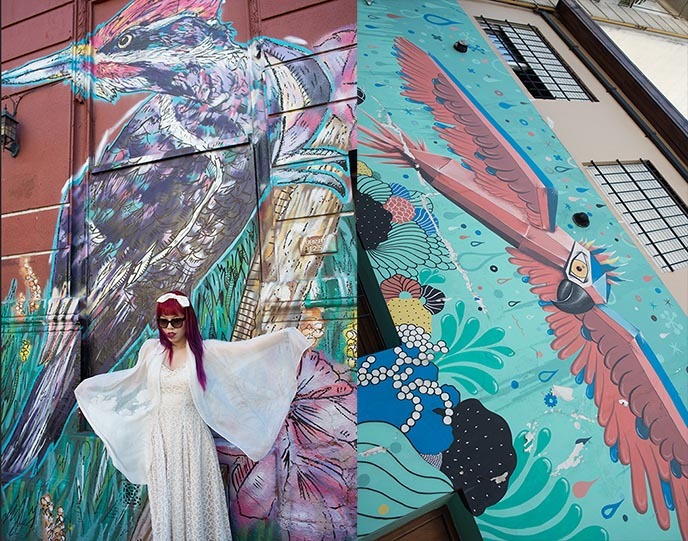 Spend time walking around Palermo, and you’ll run into cute boutiques, independent fashion, coffee shops, boutique hotels, bars… and lots of vibrant urban art. 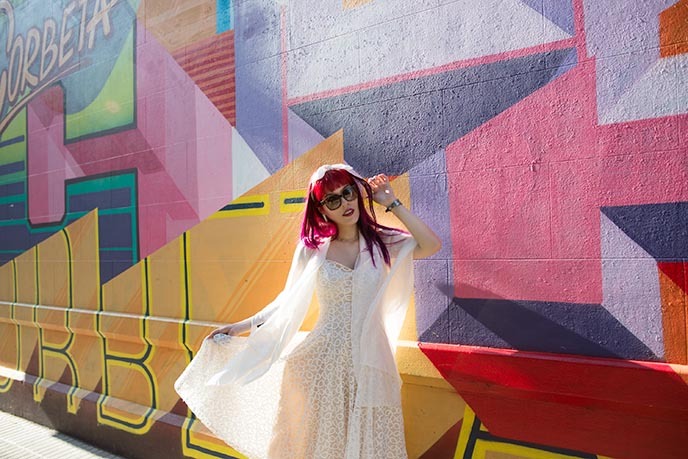 Palermo’s rainbow backdrops were the perfect place to shoot outfit photos. I’m wearing this Unique Vintage 1950s champagne ivory swing dress, called the “Carole.” Inspired by 1950s style, this long champagne frock has an ivory lace overlay, and boned sweetheart bodice with spaghetti straps — and even side pockets! Argentina was once a wealthy Spanish colony, until its emancipation during the War of Independence (1810-18). 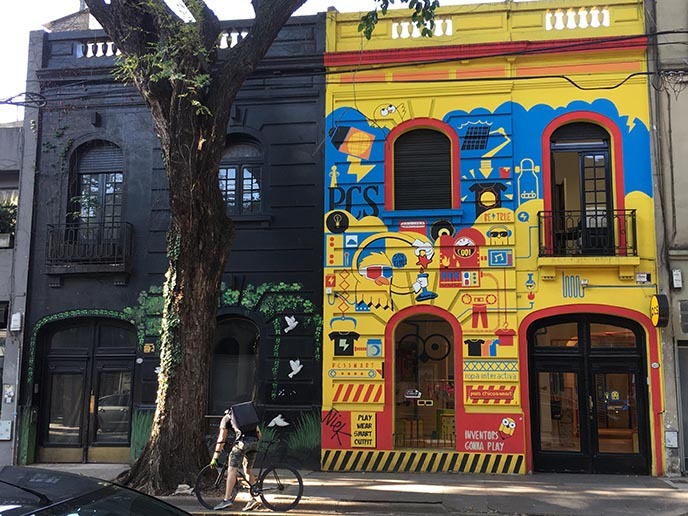 Today, Buenos Aires remains a thriving cosmopolitan capital, nicknamed the “Paris of South America” for its world-class fashion, art and architecture. Buenos Aires is one of the most developed and easy-to-navigate cities in South America. 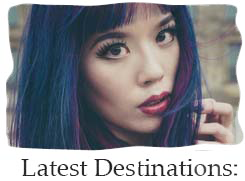 Travellers love to come here to enjoy life to the fullest: tango dancing, leisurely meals, walks through elegant neighborhoods, and lots of red wine. 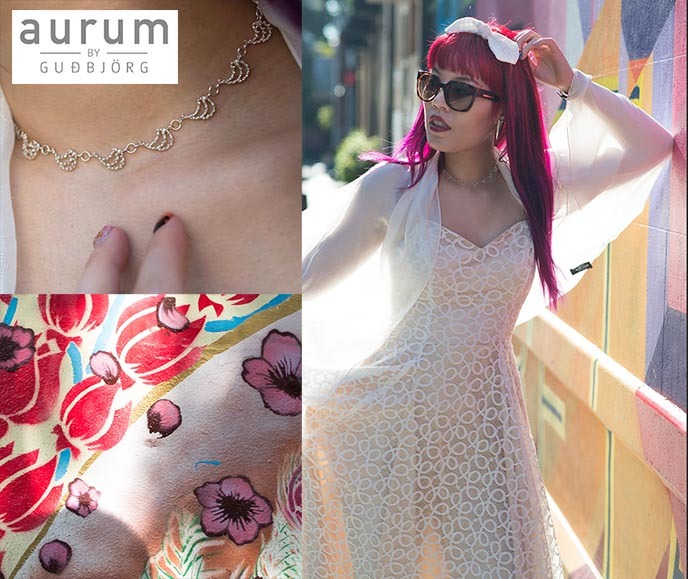 Close-up on my choker necklace by Reykjavik‘s Aurum by Guðbjörg. This Asterias design is inspired by the waves and natural forms of Iceland’s landscapes. I’m all about eye-catching jewelry that reminds me of my travels, so this is a personal favorite. 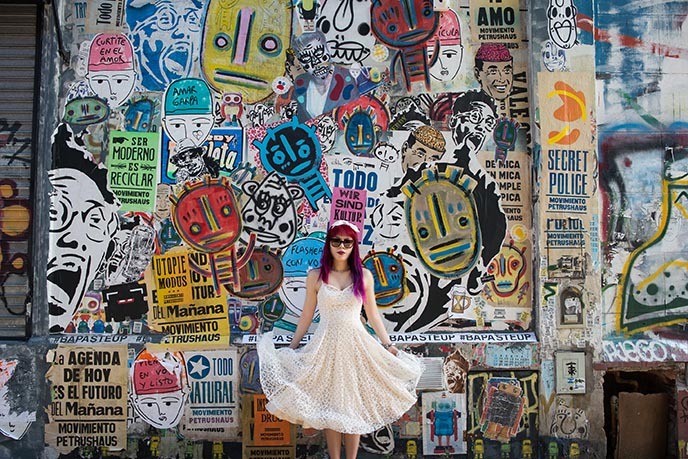 A curtsy in front of one of my favorite murals, an eclectic collage by BA Paste Up. 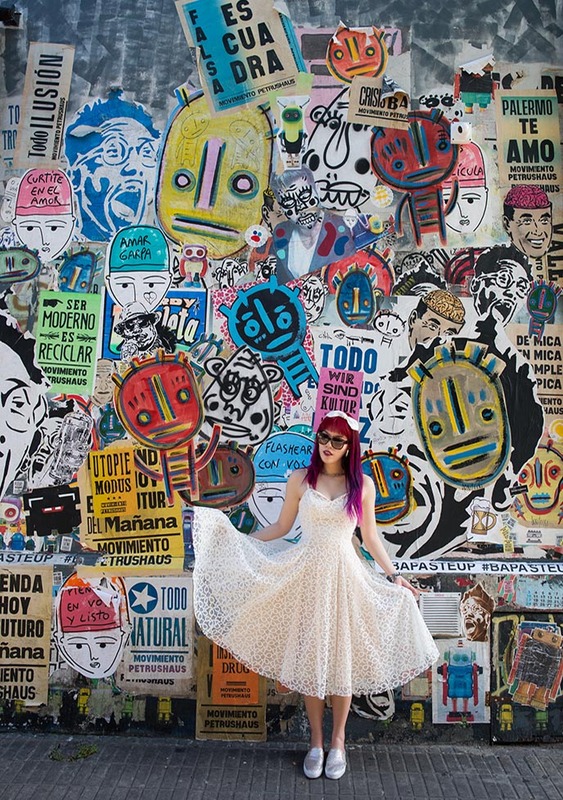 The creative Palermo area is well worth a visit, for a peek at the youth / alt subcultures of Buenos Aires. 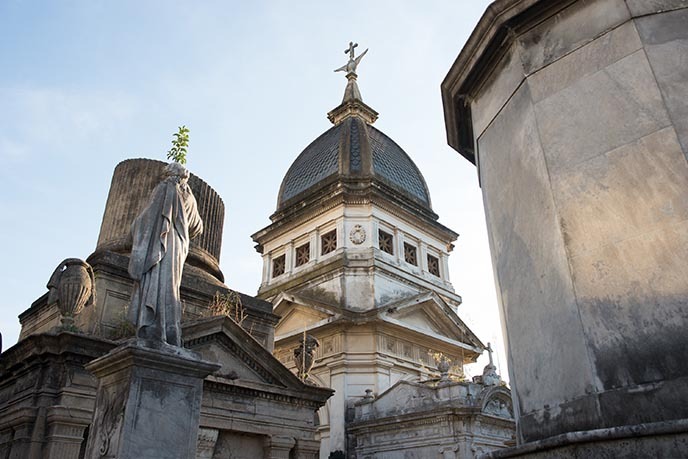 Now, for a darker destination… La Recoleta Cemetery, home to dramatic Gothic tombs. Don’t you love the Egyptian-looking one above? 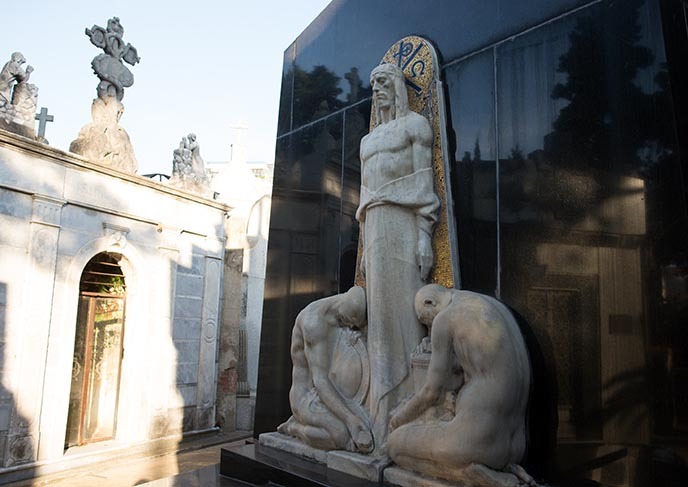 Located in Buenos Aires’ Recoleta district, this famous graveyard is the final resting place of many notables, including Eva Perón, several presidents of Argentina, and Nobel Prize winners. ‘The woman in white” fit right in with these aristocratic mausoleums arranged in rows. 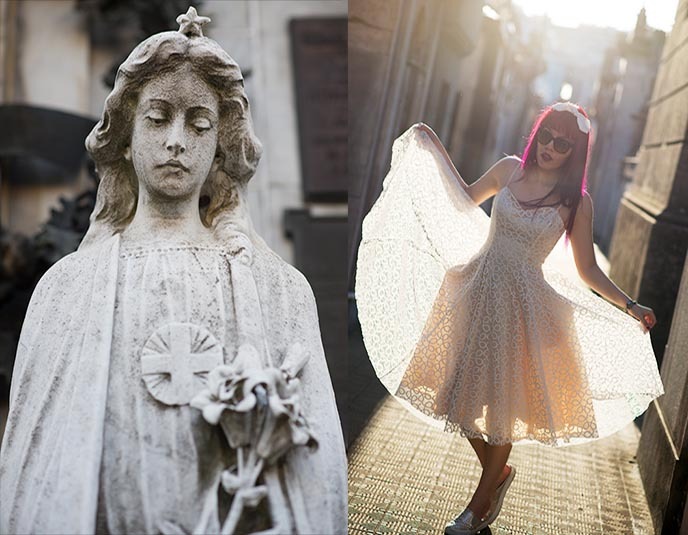 From these images, you can tell why Recoleta is considered one of the world’s most beautiful cemeteries. 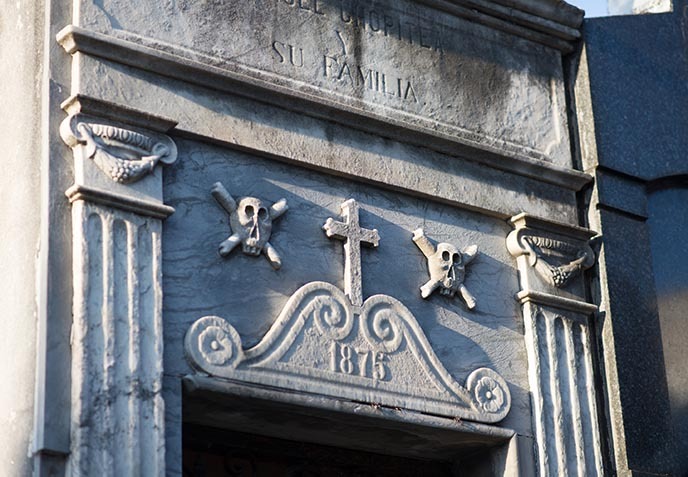 Established in 1822, La Recoleta graveyard covers 14 acres. Many wealthy residents were buried here; their families put up elaborate marble mausoleums to “keep up with the Jones.” The architectural styles range (Art Deco, Art Nouveau, Baroque, Neo-Gothic), and the graves mostly are well-maintained. These despairing angels, throwing themselves on the door of the dead… beautifully carved, and so Goth! Arr, looks like a pirate be buried here. I was curious about these skulls and crossbones from 1875… but dead men tell no tales. 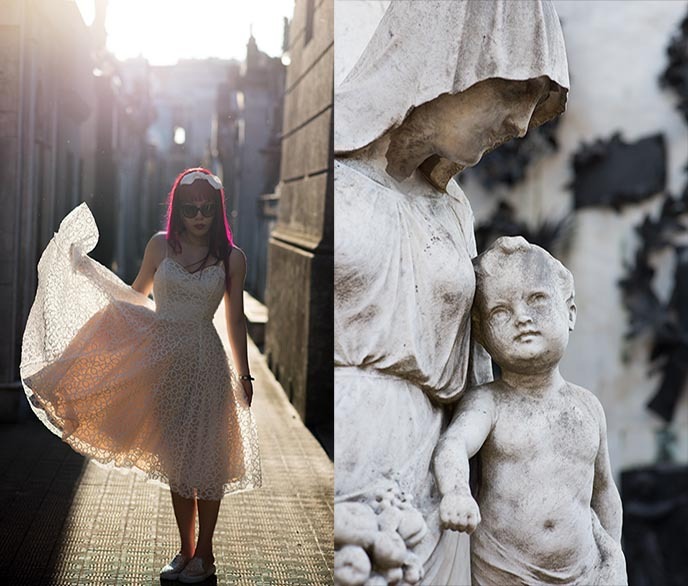 We arrived at Recoleta Cemetery as the sun was setting: the perfect golden hour for photos. Not long after, the custodian rang the bell to make sure everyone left before sundown… lest they be drained of blood by vampires, or something like that. 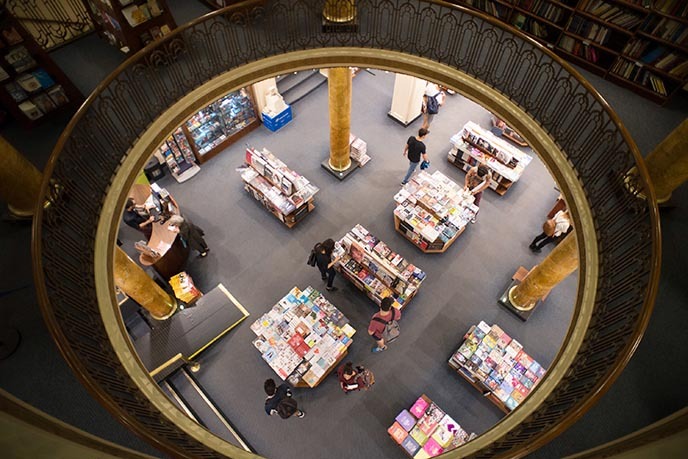 … El Ateneo Grand Splendid bookstore. The name says it all: this is an exquisite 100-year-old theater that was converted into a book shop. 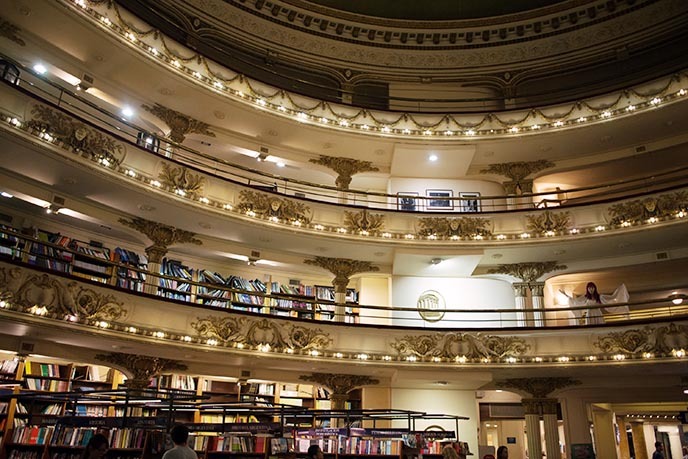 Located in Barrio Norte, El Ateneo preserves the pomp of the former Grand Splendid Theater, which opened in 1919. The bookstore retains the gilded theatre booths, red velvet curtains over the stage, and Italian ceiling frescoes. This venue has been at the heart of Buenos Aires’ entertainment industry over the years. In the earliest days, tango singers made recordings inside. The theatre became a cinema in the 1920s, and hosted the first “sound films” of Argentina. 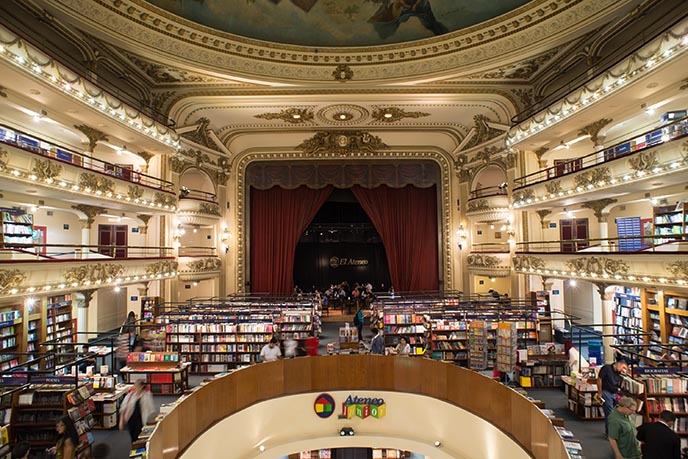 Today, the space is a wonderland for book lovers, and maintains the spirit of the Teatro Gran Splendid. 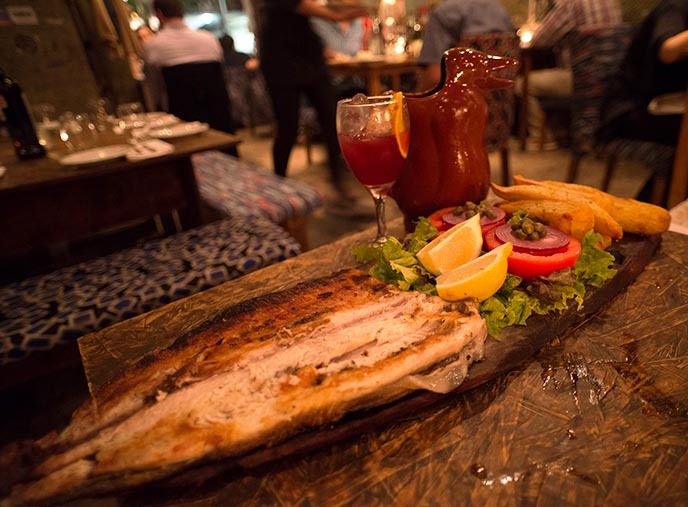 Buenos Aires’ food scene is also world-renown. The local specialty is, of course, Argentinian beef. Try the traditional “asado” or barbecue, or go to a “parrilla” (steakhouse) where the meat is cooked on metal grills by the same name. 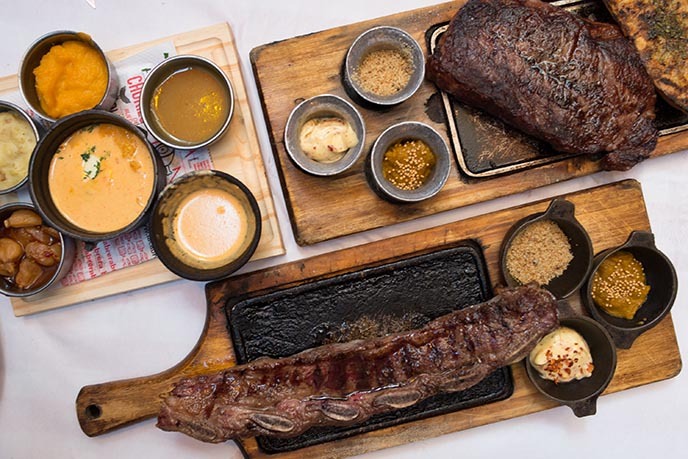 I researched the best “parrillas” in Buenos Aires, and noticed that La Cabrera steakhouse had rave reviews. I arrived at the bright, rustic courtyard-style space in Palermo Viejo — and was greeted by the chef himself, Gastón Riveira! Chef Riveira opened La Cabrera in 2003. 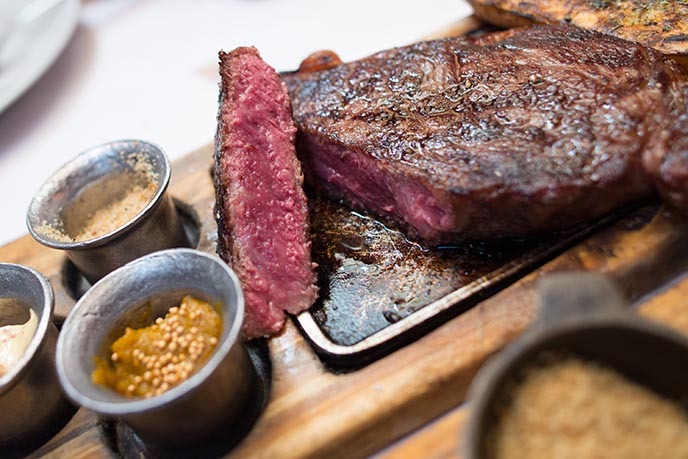 Today, he’s celebrated for his outstanding menu that offers over 25 highest-quality cuts of beef, sides and Argentine wines. He’s now also a cookbook author and has three restaurant locations in BA, as well as in Paraguay, the Philippines, Dubai, Brazil and Peru. Our attentive server was great at explaining the various specials and cuts, and showed us a photo of the various “done-ness” to choose from. If you’re not big on meat, don’t worry — La Cabrera pays close attention to all its dishes, including vegetarian options and sides. 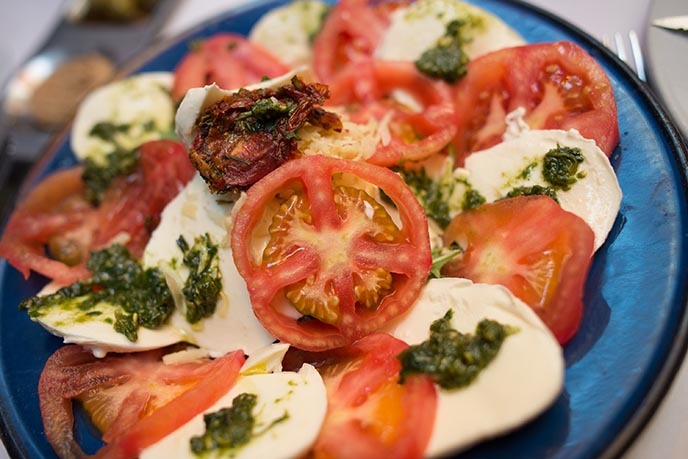 We received a generous portion of caprese salad, with the freshest pesto, tomatoes and buffala. With a glass of local Malbec (red wine), it was the perfect start. Here come the big guns. Tender short-ribs, and a spectacular Wagyu steak — one of the best in my lifetime so far. Many steakhouses overlook the side dishes, but not La Cabrera. The chimichurri green sauce, mustard and garlic dips, pureed squash, and mashed potatoes were total umami. For another “only in Argentina” meal, make a reservation at Perón Perón resto bar (Address: Ángel Justiniano Carranza 2225, 1425 CABA, Argentina). 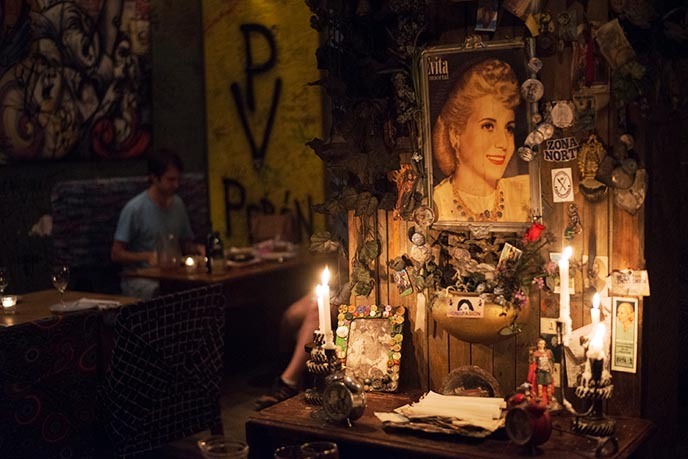 This theme restaurant is dedicated to Juan Peron, President of Argentina three times in the mid-20th century, and his iconic wife Eva Peron — aka Evita. 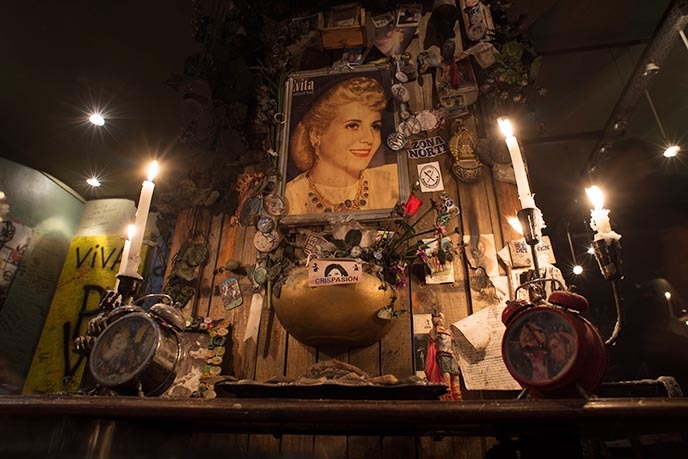 Try to reserve the special table, right in front of this shrine to Eva Peron! She smiled above us as we ate, surrounded by photos, candles, and vintage memorabilia. Eva Duarte rose from poverty to fame as a stage, radio, and film actress. She married Colonel Juan Perón and became the First Lady of Argentina upon his presidency. “Evita” is beloved for her dedication to labor rights and women’s suffrage, and a foundation that helped low-income and working class Argentines. When she died from cervical cancer at age 33, Eva Perón received the title of “Spiritual Leader of the Nation” by the Argentine Congress. We were feeling a bit “beefed out,” so we began with my beloved sardines, flavored with paprika and vegetables. For the main, we had a large and juicy portion of South American pacu, a freshwater fish related to the piranha. This rustic “meal of the people” paired perfectly with red Sangria (ginger syrup, fruit and Justicialist Party wine). The drink came in a pinguino jar, which was popular among the working class in the 1920s and 30s, and inspired by the penguins of the Patagonia region. 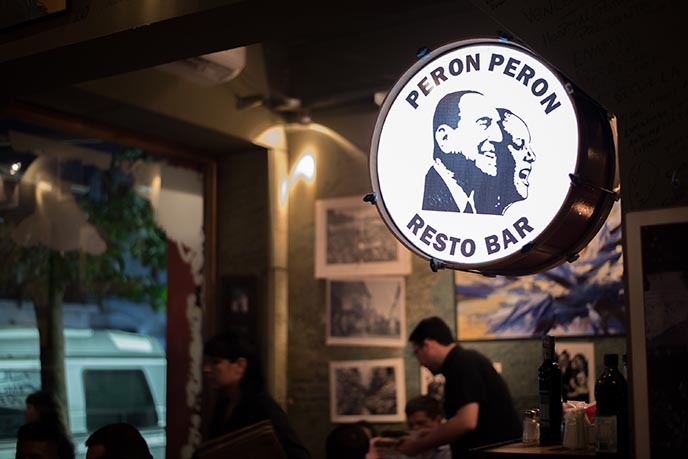 The menu stated: General Peron said it loud and clear… “When one is hungry, no bread is stale.” At Peron Peron, however, everything was a fresh as could be. The restaurant isn’t a gimmicky tourist attraction — it’s a loving tribute to the Perons. All around, you can see paintings and photos: old headshots of Evita from her acting days, the couple waving from a parade car after winning the election. Stuffed and satisfied, I was glad to return to my Wimdu apartment rental. I had a superb stay in this local flat, which let me live like “one of the people” in Buenos Aires. It was a breeze to book this apartment with Wimdu: the search engine pulled up available listings with photos and reviews, and this cute one caught my eye. I messaged with the owner, and easily picked up and returned the keys to the concierge at the lobby. I’m very glad I stayed here, as it was inexpensive and located centrally in San Telmo (I’ll show you stories from this district in the next post). Let’s end on a sweet note, and a bonus food tip. 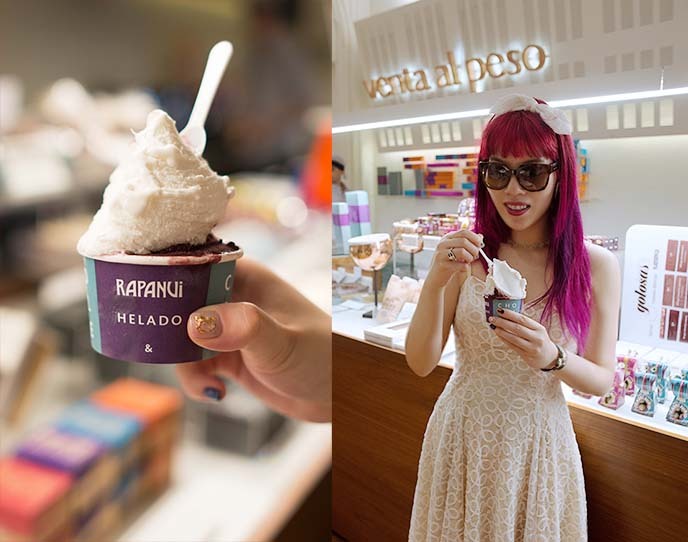 Eat all the gelato, while you’re in Buenos Aires! The city is famous for its ice cream, which goes down especially well after a day of strolling under the sun. Locals told me one of the best gelaterias is Rapanui in Recoleta / Barrio Norte, and they were correct. I ordered a heavenly double scoop, and picked up dark chocolate to bring home as well. Smile, there’s more to come soon from Argentina! Gracias LATAM Airlines for the flights here, and to Blacklane Limousines for the efficient airport transfers in a sleek black Mercedes SUV. Have you visited the city of Evita? What are your impressions of Buenos Aires so far? The songs are stuck in my head now! Omigosh to all you found in B Aires but that cemetery is a dream! Giving me #LIFE!! Greetings from Paraguay!